The clinically-proven brain fitness solution created specifically for senior living providers and their residents. A peer-reviewed clinical trial has shown Dakim BrainFitness significantly improves memory and language abilities — the two most important cognitive functions! In a peer-reviewed clinical trial conducted by the UCLA School of Medicine, published in July 2013, Dakim BrainFitness was shown to significantly improve the two most important cognitive functions — memory (immediate and delayed) and language abilities — as users strengthen attention, focus, and concentration. The effectiveness of Dakim's unique, patented brain training program is based on a proprietary and innovative brain training protocol developed by Dakim, with guidance from its team of world-renowned scientific advisors, led by Gary Small, M.D., Director of the UCLA Longevity Center. The foundation for many of the exercises in the Dakim BrainFitness program can be found in standardized neurological tests and exercises created by psychologists, neurologists and brain health researchers. Dakim transforms these basic cognitive tasks into sophisticated, imaginative, and engaging exercises that stimulate and challenge our users. Dakim's protocol provides a broad-based cognitive workout that exercises the areas of the brain that enable us to perform, at a high level, the varied cognitive and intellectual tasks essential to our careers and daily life. To do this, Dakim BrainFitness cross-trains the brain in six essential cognitive domains (long-term memory, short-term memory, language, computation, visuospatial orientation and executive function) in every brain training session. 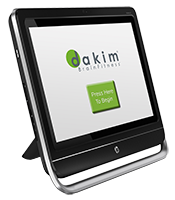 Managing every aspect of the brain training process is Dakim's patented NuroLogic™ Technology. In real time, as the user progresses through a session, NuroLogic Technology modifies the focus and sequence of the exercises presented, across six cognitive domains, and adjusts the challenge level of each exercise, to precisely match the user's requirements and performance. You can think of NuroLogic Technology as a personal trainer for your brain — making sure you get a comprehensive workout to maximize the effectiveness of every session. But as important as the science, is an approach to making this powerful and proprietary brain-training protocol as enjoyable as it is effective! 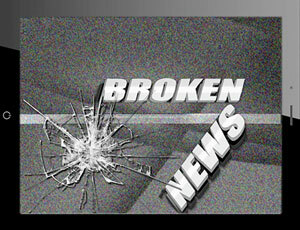 We've placed a high priority on the fundamental issues of playability, user enjoyment, and variety. Working in collaboration with our renowned scientific advisors, we've created an entirely original approach to brain training. Dakim's patented program includes more than one hundred sophisticated and engaging exercise types (comprising thousands of individual exercises) that integrate videos, music, stunning graphics, cultural references, and even a sense of humor to provide a compelling user experience. And the exercises in Dakim BrainFitness Professional have been created specifically to provide strong appeal, enjoyment, and satisfaction for users over age 75. How enjoyable? Some of our users in senior living communities have completed more than 5,000 sessions! We also regularly review the latest research findings and observe and interview individuals who use our program. This allows us to continually refine and improve Dakim BrainFitness Professional, to give our users the very best, comprehensive brain fitness program, personalized just for them. Dozens of medical research studies conducted over the past two decades (see summarized articles below) have concluded that participation in sustained rigorous cognitive activity can have a significant impact on long-term cognitive performance. Conclusion: Overall, improvement in each cognitive ability trained was retained after 5 years. Significantly less difficulty in the instrumental activities of daily living (IADL) was reported from the reasoning training group only, when compared to the control group. Additionally, when controlling for baseline age and cognitive function, participants who received booster training in the speed-of-processing intervention training group demonstrated better performance on functional measures of everyday speed-of-processing, compared to those who did not receive booster training. 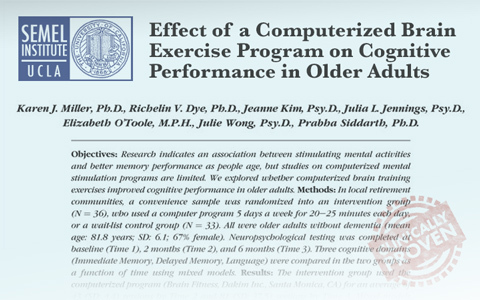 Details: Approximately 2,800 subjects, 65-94 years of age, residing independently in the community, without significant functional or cognitive decline or diagnosis of AD were enrolled and followed in the ACTIVE (Advanced Cognitive Training for Independent and Vital Elderly) study. The ACTIVE study included three intervention groups (memory training, reasoning training, speed-of-processing training), and one no-contact control group. Booster training was provided to a random subsample within each intervention group. Memory training involved verbal episodic memory; reasoning training involved the ability to solve problems that follow a serial pattern; and speed-of-processing training involved visual search skills as well as the ability to identify and locate visual information quickly in a divided-attention format. Sixty-seven percent of the sample was retained 5 years after training (approximately 1,800 individuals). Conclusion: Participation in cognitive activities was associated with a reduced risk of Alzheimer’s disease, vascular dementia, and mixed dementia. Further, subjects who frequently participated in cognitively stimulating activities "had a risk of dementia 63 percent lower than that among subjects" who participated less frequently. Lower levels of participation were also associated with higher levels of depression. Details: Beginning in 1980, the Bronx Aging study enrolled and followed 469 subjects for a median follow-up of 5.1 years. All subjects were between the ages of 75 and 85 years, and had no diagnosis of dementia. Clinical and neuropsychological evaluations were conducted at baseline, with follow-up visits every 12 to 18 months. Frequency of participation in six cognitive activities (reading books or newspapers, writing for pleasure, doing crossword puzzles, playing board games or cards, participating in organized group discussions, and playing musical instruments) was assessed. Akbaraly TN, Portet F, Fustioni S, et al. Conclusion: At a 4-year follow-up, researchers found that stimulating leisure activities were associated with a 50% reduction in risk of dementia in participants with high or moderate levels compared to those with the lowest levels of activity. Details: As part of a multi-site cohort study, researchers assessed 5,698 dementia-free, community-dwelling persons aged 65 years and older from Dijon and Montpellier, France. Leisure activities were assessed at baseline, measuring frequency of participation in various types of activities. Among the activities, "stimulating leisure activities," described as cognitive activities in which seeking or processing information played a central role, included doing crosswords, playing cards, attending organizations, going to cinema/theater, and practicing an artistic activity. Conclusion: On average, subjects who frequently participated in cognitively stimulating activities experienced 35% less cognitive decline than those with infrequent cognitive activity. Details: This population-based longitudinal study of aging and Alzheimer’s disease enrolled and followed more than 4,000 adults, aged 65 years and older as part of the Chicago Health and Aging Project. Persons with memory impairment at baseline were not excluded from the study group. Subjects were interviewed at approximately 3-year intervals, with a mean follow-up of 5.3 years. Cognitive performance tests were administered at baseline, and subjects rated the frequency of participation in seven cognitive activities (same as those listed in study directly above). Conclusion: Greater participation in novelty-seeking and exchange-of-ideas activities across the life span was associated with decreased odds of developing Alzheimer’s disease. Details: Using a case-control design, researchers collected data on 16 types of activities performed between the ages of 20 and 60 years. 264 subjects with AD served as cases, and 545 subjects without cognitive impairment served as controls. Participation in novelty-seeking activities (defined in this study as: learning a new skill, learning about a new subject, doing things that are challenging mentally, solving a problem, getting a new experience, taking up a new hobby) had the greatest association with reduced risk for AD. Conclusion: A considerable proportion of subjects with mild to moderate stages of Alzheimer’s disease pathology showed no symptoms of memory impairment. It is hypothesized that cognitive reserve, believed to be influenced by educational and occupational attainment, as well as participation in mentally challenging activities, helped these subjects to resist the clinical expression of symptoms of AD. Details: 678 Catholic sisters, ages 75 to 102 years of age, participated in the Nun Study, a longitudinal study of Alzheimer’s disease and aging. Researchers analyzed convent archives, annual physical and cognitive examinations, and brain autopsies upon death to determine correlations between aging and dementia among this population. The conclusion stated above was found by comparing the results of the last cognitive examination before death to level of neuropathology in the brain after death. Conclusion: With a mean follow-up of 4.5 years, results indicated that those who reported frequent involvement in cognitive activity at baseline were 47% less likely to develop AD than those with infrequent cognitive activity. Details: Beginning in 1994, approximately 730 subjects aged 65 years or older without a clinical diagnosis of dementia were enrolled and followed in the Religious Orders Study. Baseline assessments consisted of structured evaluations, which were repeated annually, including a medical history, neurological examination, assessment of cognitive function, and a review of brain scan when available. Investigators assessed the frequency of participation in "seven common activities that involve information processing as a central component: viewing television; listening to radio; reading newspapers; reading magazines; reading books; playing games such as cards, checkers, crosswords, or other puzzles; and going to museums." Conclusion: In relation to the two primary outcome measures, cognition and quality of life, the investigators determined that there seems to be a high probability that cognitive stimulation therapy is more cost- effective than treatment as usual. Details: An evidence-based cognitive stimulation program was developed based on reality orientation and reminiscence therapy for dementia. All subjects met DSM-IV criteria for dementia and scored between 10 and 24 on the MMSE, and had a baseline mean age of approximately 85 years. There were approximately150 subjects at the 8-week follow-up. Cognitive stimulation groups consisted of five participants and two staff members, ran for seven weeks, with a mean attendance of 11.6 sessions. Primary and secondary outcome measures were based on the Mini-Mental State Examination and Quality of Life in Alzheimer’s Disease (QoL-AD) assessment. Changes in MMSE and QoL-AD scores were used to determine cost-effectiveness of the cognitive stimulation training (CST) compared to treatment as usual. Conclusion: Among a subset of participants that developed dementia at follow-up, researchers found that a typical study participant who reported frequent participation in cognitive activities at baseline (around 11 activities) per week), had his or her accelerated decline delayed by 1.29 years. This is compared to a typical study participant who only reported 4 cognitive activities per week. Additional findings from the study also suggest that regardless of the number of years of education one has attained, late life engagement in cognitive activities might maintain cognitive vitality. Details: Researchers from the Bronx Aging Study examined 101 participants who were cognitively normal at baseline and developed dementia at follow-up (average of 5 years later). Participants’ average age at baseline was 79.5 years. Legal | ©2014-2018 Dakim, Inc.